Air Force Staff Sgt. 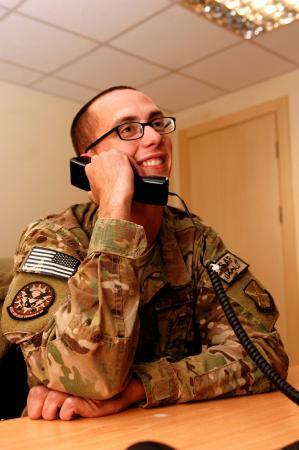 Dustin Hawkins of the 451st Expeditionary Civil Engineer Squadron at Kandahar Airfield, Afghanistan took a call from President Obama on Thanksgiving Day. A Mountain Home Air Force Base, Idaho, staff sergeant deployed to Afghanistan got a call from President Obama this Thanksgiving. During the two-minute conversation, Staff Sgt. Dustin Hawkins and the commander-in-chief talked football and family. Hawkins, who is currently assigned to the 451st Expeditionary Civil Engineer Squadron at Kandahar Airfield, is on his fourth deployment, according to a Defense Department news release. He missed the births of both daughters while away from home. His dedication to work and country earned Hawkins a nomination for the call with the president, said Maj. Aaron Brooks, 451 ECES commander. Hawkins, a power production airman, helps maintain, repair and replace 82 generators which support nearly half a million sorties flown from Kandahar Airfield each year. Before the call, Hawkins said he was nervous. Afterward, the staff sergeant said the president sounded just like he does on television — and was much easier to talk to than he imagined. Hawkins said he’d never forget the call. What did that poor guy do to deserve that.